Uploading file is a common feature in today's PHP applications. You will first have to understand the basics of file uploading in PHP, before you are able to use other fancy ajax file uploading libraries. In this series of tutorials, we will go through the basics of PHP file uploading. Once you understand the basics, you will be easily understand how client-side file uploading libraries works with PHP, such as DropzoneJs. In this series of tutorials, we will use Twitter's Boostrap framework for the UI to build a simple file upload application. In this application, user is able to upload and delete files. At the end of the series, you should understand the basics of uploading file as well as removing file using PHP's functions and common mistakes people may make. This is part 1 of the series. We are going to build a nice file upload form as well as implement uploading function. 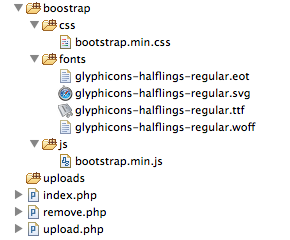 Download Bootstrap framework from this URL. We are using version 3.0.1 by the time of writing this tutorial. Create a folder "uploads", this folder is for storing uploaded files. If you are working in a live linux server, you may want to change this folder's permission to 777. This is to make sure this folder is writable by PHP script. Create a file "index.php", it is the front page of our application. Create a file "upload.php", it is for uploading files to "uploads" folder. Create a file "remove.php", it is for removing files from "uploads" folder. In this simple file form, pay particular attention to the form's attribute "enctype", we set it to "multipart/form-data". This is probably one of the most common mistakes people make. When this attribute is missing, our backend PHP script will not be able to detect the file object. So please always rember to set form's "enctype" attribute to "multipart/form-data" when working with file. In this application, we will also restrict the uploading files' extensions to jpg, jpeg, png or gif only. And maximum allow file size is 1 MB. This is to demonstrate how to perform file validation. You may also notice the "action" attribute is pointed to "upload.php". That is where we are performing backend uploading process. Here comes the backend uploading process. We have created a file for handling this part at "upload.php". Open the file, and copy codes below to the file. It seems lots of code and complex, but do not worry, we will go through each section later. At the beginning of the file, we enable PHP to report any error. This is to prevent some errors being buried and cause us difficulty for debugging. Normally this should be turned off, so that the errors do not show on your live server. You will never want your website's visitors to view your server errors. Next, we check if it is a POST request by inspecting "$_SERVER['REQUEST_METHOD']" value. If it is a GET request, that is when "upload.php" is opened directly, there will be no processing. $name: the uploaded file's name. $error: error code during file uploading process. PHP returns corresponding error code during a file POST request. We use this as a flag to determine if the file is successfully posted from client machine to the server. $size: the size in bytes of the uploaded file. $ext: the extension of the uploaded file. Next step. We use the flag "$error" to check if there is any error happened during the upload process. There are numbers of possible errors, such as file was partially posted, server has restricted maximum post file size and so on. You can check the "$response" string to get a better idea of the error. When configured properly, these errors can be eliminated. If you do run into any of those errors, check out this tutorial to fix them. When there is no upload error, that is when "$error" equals to "UPLOAD_ERR_OK" in the switch statement. We are going to perform our own validation rules as well as moving the successfully uploaded file to "uploads" folder we have created initially. The logic here is actually pretty straightforward. First we check if the "$ext" is falling into any of pre-defined extensions. Then we check if the "$size" is less than 2 MB. Pay attention, since the "$size" is in bytes, we need to divided it by 1024x1024 to get the correct megabyte value. Lastly, we move the temporary object to "uploads" folder. That is done by PHP function move_upload_file. If you just get started, you need to understand the concept of uploading file in PHP. File is first posted to the server via the form and store in a temporary place in server. You then need to move that temporary object to your defined directory. In part 2 of this series, we will first enable the uploaded files to show on "index.php" page and implement delete function. And of course, source code will be available for downloading in part 2.